As I am epileptic and a Graphic Designer and know all about MRI (magnetic resonance imaging)scans, believe me I have traveled 100’s of miles for the privilege to be inside one of these things so that someone could try and determine what was wrong with my grey matter. I had to blog this. I could not justifiably edit article, so here it is in full. The copyright of course belongs only to the Times Newspaper and Angela Palmer, if you can go to her exhibition please do and if not then please visit her website, its worth it, the link is below. Angela Palmer’s first scientific inspiration came from viewing the Nobel prize-winner Dorothy Hodgkin’s model of penicillin at the History of Science Museum, in Oxford. Struck by how such a simple object – made from Perspex – could demonstrate such a complex subject, Palmer vowed to put a similar design principle to work in her art. She was studying at the Ruskin School of Drawing and Fine Art in Oxford and soon had the chance to draw the corpses in the dissection rooms. Her interest in human anatomy led her to contact Stephen Golding, the head of radiology at the John Radcliffe Hospital, where she had a series of full-body MRI scans to look deeper at the human body. Dr Chris Avery, an academic radiographer at John Radcliffe Hospital, worked with Palmer on the MRI sequences. He says: “This crossover between art and reality bridges the gap between science and art, making it more real to people.” He adds that it’s “rewarding to see your work transformed into another medium. It’s the finest accolade that your work is good enough to form the basis of something else”. 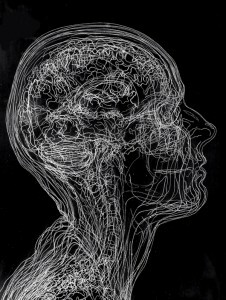 The MRI portraits will be at the Royal College of Medicine, London, from October 2007.